On the eve of Crimefest, we’re delighted to hear of Titan / Hard Case Crime’s UK launch of Stephen King’s JOYLAND at the Bristol based convention. Best-selling author Stephen King returns June 7th with JOYLAND, a breathtaking mystery novel set in an amusement park in the 1970s, published by the award-winning Hard Case Crime imprint of Titan Books. 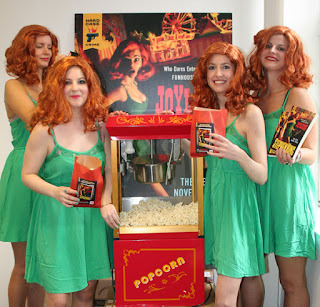 Encouraging UK book lovers to act on King’s call to arms and buy paperback copies from traditional retailers, a team of ‘Hollywood Girls’ from the world of JOYLAND will be touring shops and literary events during the week of the book’s publication to give away free JOYLAND-branded bags of popcorn. Bookstore shoppers will also be able to win free books and exclusive JOYLAND prizes by tweeting pictures of the Hollywood Girls. Sales Director of Titan Books, Tim Whale, elaborates: “We believe that the excitement galvanised by the Hollywood Girls with their popcorn machine will ensure that fans will respond to King’s rallying cry and buy their copies of JOYLAND from their local bookseller”. Dressed in the costume designed by Glen Orbik for the cover of the book, four ‘Hollywood Girls’ and their vintage popcorn machine will start their tour at Crimefest in Bristol on June 1st and end at Stoke Newington Literary Festival on June 9th. They will travel via Foyles Charing Cross Road [June 4th] and Forbidden Planet Shaftesbury Avenue [June 7th]. There will also be 50 bags handed out by booksellers on June 4th at Foyles Royal Festival Hall, Foyles St Pancras, Foyles Westfelds Statford City and Foyles Westfield White City. With the emotional impact of King masterpieces such as The Green Mile and The Shawshank Redemption, JOYLAND [Hard Case Crime, original paperback, June 7th 2013], is a whodunit and a heartbreaking tale about love and loss, growing up and growing old, and about those who don’t get to do either because death comes for them before their time. JOYLAND is published by the award-winning line of pulp-styled crime novels published by Titan Books, Hard Case Crime. Stephen King’s last title for Hard Case Crime – The Colorado Kid – was an international bestseller and inspired the TV show Haven, about to go into its fourth season on the SyFy network. I usually go to Crimefest but decided not to this year. Sounds like it had a good programme, as usual.